Chibok girls being accompanied by soldiers after their release. 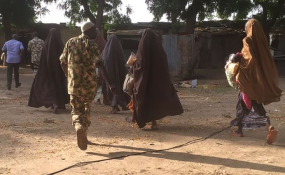 Boko Haram militants, Sunday, invaded a village at Chibok in Borno state while members of the Abducted Chibok Girls Parents' Movement for Rescue were commemorating the fifth anniversary of their abducted daughters. The village District Head, Mallam Bulama, who was outside of the community, also phoned and confirmed to Daily Trust that insurgents invaded his village and were still there making destructions as of Sunday night. Some of them had fled from captivity themselves while government had negotiated the release of many of them, but more than one hundred girls are still missing.